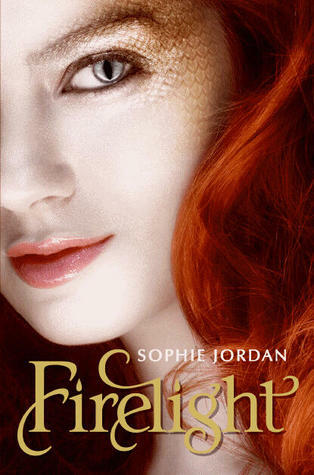 Firelight by Sophie Jordan is an intense, intriguing and well-crafted start to what is surely to be a great series. The characters are all incredibly unique and well-rounded and the world in which it takes place is fasinating. Jacinda, the heroine, is a draki - a decedent from a dragon. She can shift between human and dragon form and she lives for the thrill of flight. Not only is she a draki, but she is a rarity among her people; she is a fire-breather. Each of the draki possess a certain trait, some are water draki, some are gifted with herbs, but she is the only fire-breather to manifest in a long, long, time. Everyone had thought her particular species had died out long ago, but when she manifested she became a coveted prize. Her dragon Pride would like nothing more than to breed more little fire breathers so an arranged marriage of sorts, is setup. Jacinda is destined to mate with the Pride's prince, Cassian. She does not appreciate having her life planned out for her and so Jacinda rebels and breaks the Pride's number one rule - she flies during the daytime. While she is out she is spotted by a group of dragon hunters and injured during the pursuit. She is forced to take refuge in a cave, where one of the young hunters finds her. Surprisingly he spares her - why is does in unclear to Jacinda, who is still in her dragon form. Long story short, the Pride is furious with her and decides she must be punished. Her mother, who fears for her daughters safety forces Jacinda and her twin sister, Tamera to flee in the middle of the night. Jacinda does not want to leave the pack and is furious when her mother relocates them in the middle of the southwest desert. Jacinda is forced to try and fit in with humans and expected to let the dragon inside her die. I cannot express to you how much I enjoyed this book. I love Jacinda - she is such a strong willed and determined character. Her relationship with Will, the young hunter, is so beautifully written. I love the fact that they have the whole star-crossed lovers thing going on - she is a draki; the species in which he and his family hunt. You spend a lot of time wondering whether or not she will own up to her heritage and tell Will what she truly is. It provides a great dynamic to their story, because although she is drawn to him, she still isn't sure if she can trust him. I think that Jordan did an exceptional job writing Will's character as well. He isn't just your typical heartthrob, he seems to truly care for Jacinda. He also protects her on numerous occasions and tries to protect her by staying away from her. He, like Jacinda has to stay guarded, because he is afraid of letting the world see him as a part of his monstrous family. The only thing that somewhat irritated me about this book was Jacinda's mother. I understand that she felt Jacinda was no longer safe with the Pride, but I thought it was completely unfair for her to try and force Jacinda to let her inner draki die. I just feel like a mother, at least a good one, wouldn't ask her daughter to give up a part of her that she so obviously loved. Jacinda states countless times throughout the book that her draki is an overwhelming part of her and that she cherishes it. I just don't believe her mother would force her to give that up completely. All in all though, Firelight was outstanding. If you haven't had a chance to read it yet, I highly suggest you do. I cannot wait for the next book, Vanish to come out next year! I have this on hold from my library but I don't think they have actually gotten it in yet!